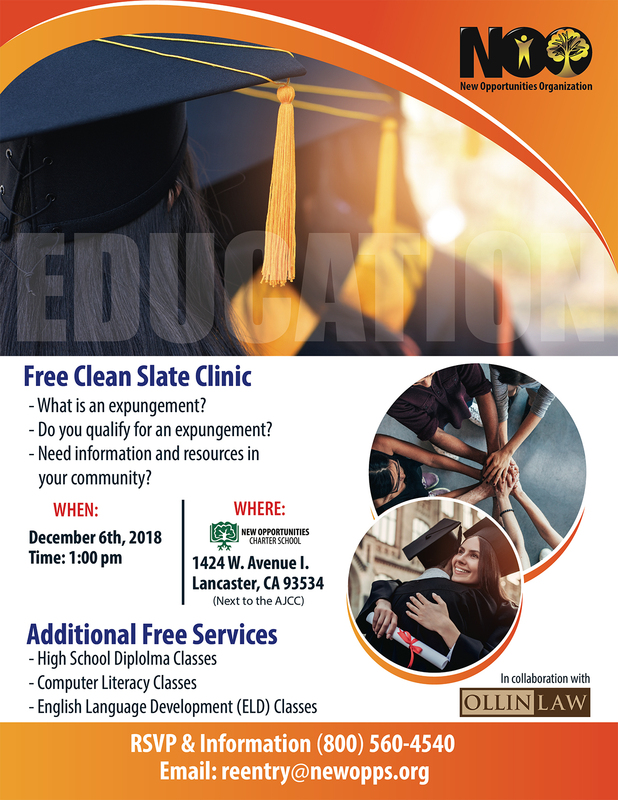 Free Clean Slate Clinic at our Lancaster Site! -	What is an expungement? -	Do you qualify for an expungement? -	Need information and resources in your community? The New Opportunities Organization will admit students with any disability, or of any gender, gender identity, gender expression, nationality, race, color, national origin, ethnicity, religion, sexual orientation, or any other characteristic protected under state or federal law to all the rights, privileges, programs, and activities generally accorded or made available to students at the School. The Organization and its Charter Schools do not discriminate against students on the basis of disability, gender, gender identity, gender expression, nationality, race, color, national origin, ethnicity, religion, sexual orientation, or any other characteristic protected under state or federal law in administration of its educational policies, admission policies, and other school-administered programs.